Bonney, A., Phillipson, L., Reis, S., Jones, S. C. & Iverson, D. (2009). Patients' attitudes to general practice registrars: a review of the literature. Education for Primary Care, 20 (5), 371-378. Introduction With the population ageing, it is imperative for training practices to provide GP registrars with sound experience in managing the health problems of older persons, especially chronic conditions. However, it is reported that a significant proportion of these patients will be resistant to consulting registrars, with concerns regarding disruption of continuity of care being a significant factor. The challenge for training practices is to identify approaches to engage registrars in the management of older patients whilst maintaining patient satisfaction. This paper presents a review of the literature on patient attitudes to general practice registrars to better understand the nature and magnitude of the challenge, and to identify important research gaps. Methods Major electronic medical literature databases were searched for relevant articles using search terms including general practice, registrar, doctor-patient relationship, patient attitudes and elderly, for the period from 1980 to March 2009. The studies were analysed by methodology, content and theme. Results A total of 15 studies were identified that directly addressed patients' attitudes to GP registrars. Whilst there appeared an overall high acceptance of registrars by patients, increasing patient age was associated with more negative attitudes towards registrars, reduced trust and decreased satisfaction with communication. Presentations for chronic or emotional problems were associated with reduced willingness to consult registrars. Patients generally appreciated an ongoing involvement with their usual GP. Discussion These findings have implications for training practices and research directions. Demonstrating continuity of care through shared chronic disease management between supervisors and registrars is a possible model that meets registrars training and continuity needs. 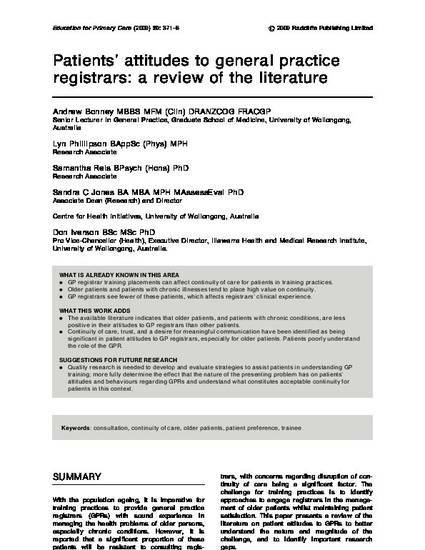 There is a need for quality research on the type and magnitude of problems affecting GP registrar encounters with older patients and, based on results from these studies to, create and assess models of registrar training involving older patients, that meet patients' needs for continuity of care.